The beautiful lantern filled ancient town of Hoi An in Vietnam is somewhere that holds a special place in my heart. It was a place that I had been desperate to visit for long time and when I went there on my solo travels in Asia Last year, I loved it even more than I’d expected to- in fact I loved it so much that I stayed twice the length of time that I’d originally intended. So, what makes Hoi An so special? What I loved moved about Hoi An was its sheer beauty. Narrow lanes, covered in colourful hanging lanterns, with a little river running through the centre of it. There’s no denying that the town is touristy but having said this, it somehow manages to maintain its authenticity. I loved tucking into a big bowl of noodles at the bustling Central Market in the day, perusing the night market in the evenings and of course exploring the many wonderful cafes that Hoi An has to offer. There are a lot of places to get your caffeine fix in Hoi An and out of all them, Hoi An Roastery was my favourite. It’s actually a local cafe chain and they have six locations in the town but my favourite one was their original location by the Japanese bridge. I came here most days to read my book and enjoy a Ca Phe Sua Da or an egg coffee. What I loved about Hoi An Roastery was the way that it managed to look really contemporary yet still in keeping with Hoi An’s traditional buildings. All of the cafes locations are all really spacious, light and open plan. That means that even if it rains- and when I was in Vietnam it rained a lot- it still felt like I was outside in the hustle and bustle of the towns streets even if I sat inside. Each and every one of the cafes locations offers a different scenic view of Hoi An. The cafe by the Japanese Bridge was my favourite for people watching but I also loved the upstairs balcony on the one by temple and the views over the river from its riverside location too. Hoi An Roastery specialises in great coffee- in fact they source their own beans from nearby in Dalat, roast them in Hoi An and they have the best range of coffees around. While I would always advise to stick to the more traditional Vietnamese coffees (because once you get a taste for Vietnamese condensed milk coffee there is no going back), they also do fantastic espresso based coffees, great for travellers missing a taste of home. They also offer a section of sandwiches, traditional Vietnamese dishes and cakes. My advice- get the banana bread. 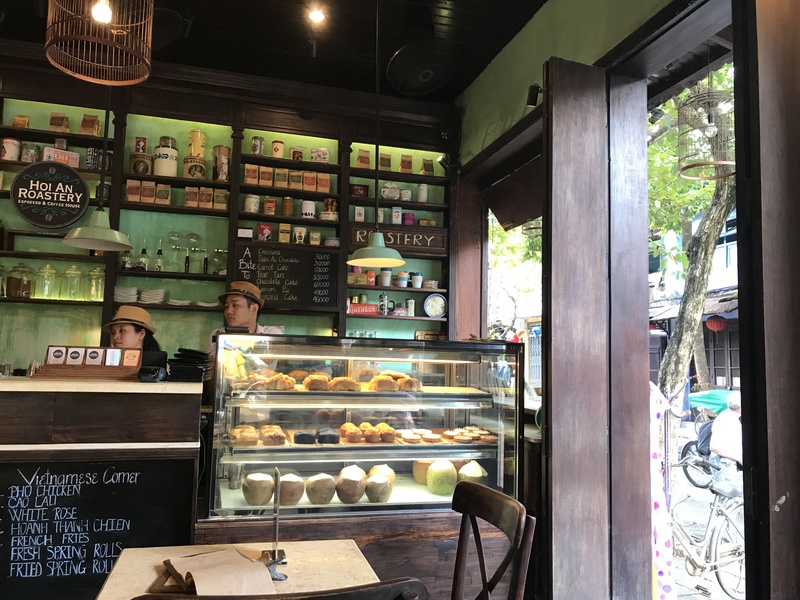 I’m not going to sit back and pretend these are the cheapest cafes in Hoi An- the little street side stalls frequented by the locals will always be your best bet, Hoi An Roastery’s cafes are however, still fairly cheap and as a chain, it beats Starbucks anytime. Phoebe, I’m months late in visiting your blog. You’ve visited a part of the world here unimaginable for an American of my much older generation. Happy travels, and thanks for visiting Under Western Skies. Hi Brad, great to hear from you. I’m so glad I could bring you on the travels via the blog. Best of wishes!